Now available in A3 and A4 sizes! An A3 or A4 angle adjustable copy holder which can be well placed between the keyboard and monitor to help reduce awkward neck and eye movements, thus promoting better health. The 7 levels of adjustment ensure that the user can obtain a position so suit them. Each CLEAR COPY angle is locked at the desired angle, but can be adjusted if required. Supports either A4 or A3 documents, and with the aid of the CLEAR COPY removable rigid shelf, the CLEAR COPY can also support lever arch files and books. Padded document shelf – Built-in! Adjustable Reading Surface – Built In! Adjustable Writing Surface – Built In! Removable Rigid Shelf - Included! 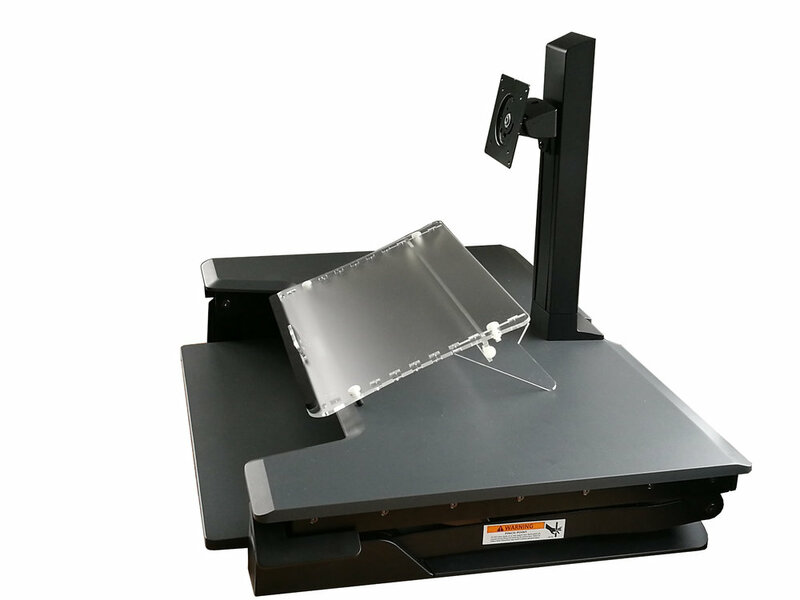 The intelligent and space saving design of the CLEAR COPY copy holder/reading & writing slope boasts an impressive 7 levels of adjustment from 19 – 40 degrees. Angle adjustment: 19 - 40°. A3 Size: W 470mm, D 320mm, H 110mm (min). A4 Size: W 300mm, D 320mm, H 110mm (min). A3 version shown, A4 version available. Adjustable front stop makes it perfect to adapt to Sit/Stand solutions.